Tag Archive | "energy sector"
Multi currency seasoned bond yields offer special potential now. One benefit of being aged 62, with 40+ years of global investing under the belt is that it is easier to spot rare opportunities that only come once in awhile, simply because I have experienced them before. Current events in the multi currency seasoned bond market remind me of the last great credit crunch in the 1970s when you could earn high yields on multi currency bonds. First, a quick primer on investing in seasoned multi currency bonds. A seasoned bond is a loan that was issued over six months ago. When that bond was issued, a currency, maturity date and (depending on the prevailing current interest rates at time of issue), an interest rate is set. Take the US dollar GMAC Bond 6.875% 15/09/2011 as an example. This means that General Motors Acceptance Corp. borrowed US dollars and promised to pay 6.875% interest until September 15, 2011 when it will repay the loan. The bond, again depending on current interest rates and the credit rating of the company, was issued either at par or at a premium or discount. If the bond was sold at par to begin, investors who invested $10,000 bought a $10,000 bond. If it was sold at a discount they paid less than $10,000 for a $10,000 bond. If there was a premium, investors paid more than $10,000. Interest however is usually paid semi annually on $10,000 (though it can be quarterly or annually) so every six months (March and Sept.) the investor has received $343.75 (half the $687.50 which is 6.875% of $10,000). This bond is seasoned because it is now offered for sale in the bond market…just like a share is sold on the stock market. However it is the interest rate, rather than potential dividend, that sets its fundamental price. This GMAC bond above, as of September 2008, had three years until it matures (meaning when the $10,000 is paid back). Interest of $687.50 (6.875%) will be paid each year so this bond is worth in total $2,062 (6.875% interest) plus $10,000 (repaid in three years) or $12,062 over the three years. If interest rates rise to 7.5%, then the bond is worth less because a new bond offering 7.5% would be worth $12,250. The seasoned bond example would fundamentally be worth $188 less than a 7.5% bond. All other things being equal, the example seasoned bond above would sell at a discount price of about 99.
makes up for the lower interest of 6.875% versus 7.500%. That is the fundamental that drives bond prices…but just like shares, the market then has opinions based on the credit rating on how much interest rates will change, etc. These opinions are based on the number of years to maturity, expected interest rate change and expected credit worthiness of the borrower. Just like shares on a stock market, bonds on the bond market are usually bought and sold for more or less than they are fundamentally worth based on a buyers and sellers differing opinion. Right now bond markets appear similar where they were in the 1970s (when I made a killing by buying good quality bonds). It appears that the human emotion of fear has caused bonds to be oversold. For example that US dollar 6.875% 15/09/2011 GMAC bond we used as an example above was for sale yesterday at 34.00. In other words an investor could have bought a $10,000 bond for $3,400. This created a yield potential of 54.27%. Investors would get back $12,062 over three years for an investment of $3,400. They nearly quadruple their money in three years. This bond was used as an example but this lesson does not recommend this bond which has a junk bond credit rating. The reason for this huge discount is that GMAC may not be able to repay the $10,000 in three years. Investors may lose part or all of their investment . Buying this bond is a speculation. Most of us should leave it to the gamblers and pros. However, wise investments are available in better quality discounted seasoned bonds. bonds with low credit rating (like the GMAC above) have dropped by massive amounts. But also more secure, safer corporate bonds with a higher rating have been hit hard as well and are available at big discounts. 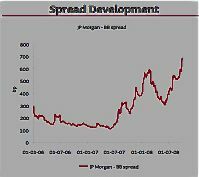 The spread on European euro denominated BB- rated corporate bonds has, for instance, increased sevenfold compared to the spread in the spring of 2007. The euro spread is the extra interest earned above what a top quality major market government bond Such bonds are considered a baseline of safety. Risk premium is measured by how much more a bond will yield than these safest bonds. The chart below shows that in 2007 investors could earn 3% more than the safest bonds. Now they can earn 7% more. This large sell-off in reasonably safe bonds is due to investors’ search for liquidity. This falling price on these better credit corporate bonds creates a golden opportunity for long-term investors. Take for example, a Gazprom bond denominated in euro with a 7.8% coupon (interest rate) that matures 27-09-2010 (September 27, 2010). This bond in the energy sector has a A3 / BBB but is selling at the discounted price of 97.50 which creates a 9.2% yield or 6.03% over the safety baseline. All investments have risk…now more so than in most times. The key to good investing is to make sure you are paid an adequate premium for taking the risk. As we look at examples above and below, remember that rates change continually so earnings an investor can actually make, may be more or less depending on rates at the time of investment. In the Gazprom example above, a €9,750 investment on September 27, 2008 returns €11,840 over two years. €1,840 in interest and €10,000 in maturity September 27, 2010. Let’s now look at a US dollar example of a Gazprom bond. The 7.93% June 28, 2013 Gazprom issue is offered at the discounted price of 82.25. his creates a yield of 13.08% which is a premium of 10.64% over a US Treasury bond. Investors would pay $8,225 for the $10,000 bond in this example. The bond would then pay $793.30 per annum interest through June 2013. In 4.5 years this is a total interest earning of $3,600. Plus the bond, at maturity returns $10,000 or a total return. This creates a total return of $13,600 on the $8,225 investment. Over the four and a half years the total profit is $5,375 on $8,225 invested or 65.34% (about 14.52% per annum). This is an excellent return for investment grade bonds. In addition investors with $100,000 to invest can create a multi currency sandwich by borrowing up to one time the investment. US dollar loan interest is in the 4% range. Imagine the example of an investor who invests $100,000 in December 2008, (used to make the calculation an easier 4.5 years, Dec. 2008 to June 2013) plus borrows $100,000 and invests the entire $200,000 into bonds of this type. Assuming this same discount prevailed at that time, $200,000 would buy about $242,000 of such bonds at the discounted $82.25 price. The total interest earned from the bonds from now to June 2013 would be about $86,350 minus an interest cost of $18,000. This leaves $68,350 of net interest earned. Plus of course $242,000 is paid back at bond maturity. The loan repayment would be $100,000 leaving $142,000. The total earnings on the original $100,000 invested would be $68,350 plus $142,000. The investor gets $210,350. This is a total net profit of $110,350 above the original $100,000 invested. This is a 110.35% total return or about 24.52% per annum over the 4.5 years. There is no currency risk in the loan because it is in US dollars and the investment is in dollars as well. One risk is that the interest rate on the loan could rise. In this case you would normally just sell bonds to pay off the loan if the interest rate of your loan rose higher than your yield. However there is another risk…normally one so remote we would barely mention it. With such short term bonds the capital value of good and even medium risk borrowers would hardly ever fall, unless there was some special corporate misfortune. Never would we expect all investment grade bonds to lose much capital value. These are not normal times though. This is why we may never see such a guaranteed profit potential with such a low risk again. However in the short term, if liquidity continues to tighten the yield on such bonds could rise even more and their capital value fall further. Be sure to review your liquidity needs with your investment advisor. You do not want to be caught having to sell at the wrong time. Plus if you leverage though a loan…never leverage more than you can afford to lose. In a real time situation investors would also normally diversify into more than one bond for greater portfolio stability. I have been sending my Multi Currency Course subscribers a seven chapter report about the bond potential now. This report contains a review of many bond recommendations. You can have this report as a multi currency subscriber. Learn more about how to subscribe to our multi currency course. You can invest in the bonds mentioned above via Jyske Bank (American investors can use Jyske Global Asset Management JGAM). I just finished a long meeting with Thomas Fischer at JGAM to review the updated services that JGAM. JGAM now has an advisory service so US investors can invest in multi currency seasoned bonds. Based on what I learned about the new services Jyske offers Americans, I am personally investing $1 million in a new program to help my multi currency course subscribers understand how to use these services. You learn how to use this million dollar program when you subscribe to our multi currency course. Jyske Bank is Denmark’s second largest bank and I have worked with them for over 20 years. They are my main bankers and investment advisors and have in depth multi currency investment experience. On October 10 2008, Moody’s affirmed Jyske Bank’s long-term Aa2 rating stable rating. The affirmation of the ratings reflects Jyske Bank’s strong domestic retail and commercial banking franchise, current good asset quality, strong capitalization, and strong risk management. This decision came despite the deteriorated economic prospects in Denmark, particularly in respect of the property market. Also on Friday 10 October 2008, Jyske confirmed that it had no exposure to Iceland debt. In addition the Danish Parliament passed a bill that secured all deposits and unsecured claims against losses in Danish financial institutions. The agreement was designed to reassure both depositors and the banking community. It is up to each bank to decide to join the new guarantee scheme. Jyske Bank announced that it will join the new government guarantee scheme. During the two-year programme, banks cannot issue dividends, make share buy-backs or establish or renew share option schemes for managers. The rating of the Kingdom of Denmark is Aaa/AAA with Moody’s and Standard & Poor’s respectively. Until next message, may your multi currency investing bond with high profits. 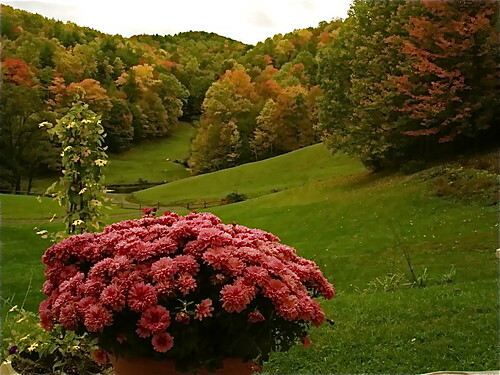 There is great beauty here in the Blue Ridge as the leaf change begins to take hold. Here is my front yard view now. The salmons and gold mean its time to think SOUTH, WARM and SUNNY. 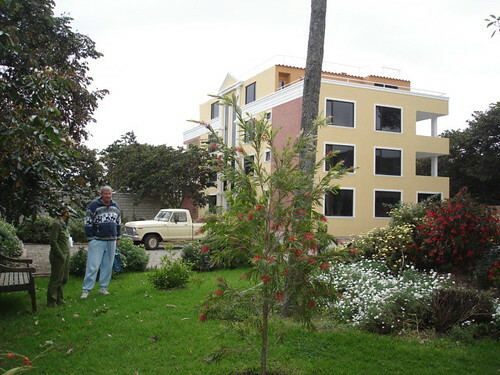 This will be my Cotacachi Ecuador view soon. Join Merri, me, Steve, Kjetil Haugan and Peter Conradsen of Jyske Global Asset Management in Cotacachi Ecuador. We’ll review economic conditions, Ecuador real estate, my entire portfolio, seasoned bonds and investing and business ideas for the months ahead. Our delegates have a great time as they learn. 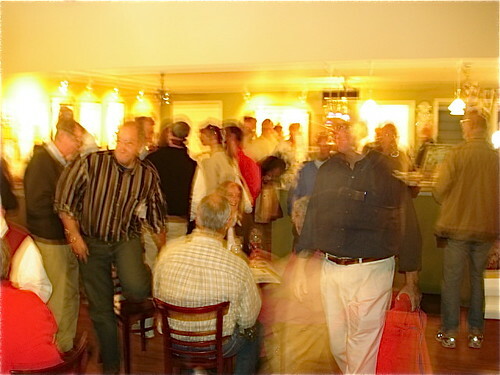 Here is last week’s group enjoying an organic wine and cheese reception after the course at Bohemia Gallery and Cafe in West Jefferson North Carolina. Stay on for the real estate tour Cotacachi and surrounding areas. 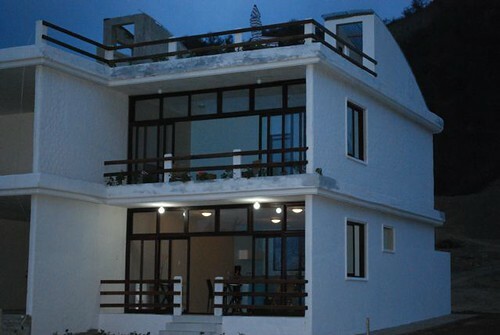 See wonderful condos like this for sale at $46,000 in Cotacachi. 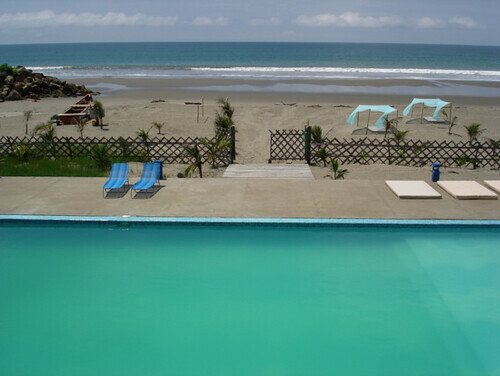 Then travel to the coast. See Vistazul condos like this for $89,000.